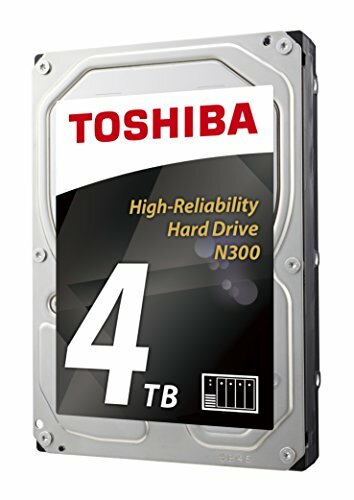 Toshiba's N300 3.5-inch internal hard drive offers high reliability for NAS and other high-performance storage systems. It is optimized to meet the reliability, endurance, performance and scalability requirements of 24-hour x 7- day high-capacity storage for personal, home office and small business use. The N300 is ideal for multi-RAID systems supporting up to 8 drives and workloads of up to 180TB per year. Perfect for small workgroups hosting a cloud or seeking centralized data sharing, storage and backup. Each drive is packed with advanced technologies to ensure the long-term reliability and performance you demand. Multiple shock sensors detect and compensate for shock and rotational vibration, while heat prevention controls automatically adjust seek speeds to minimize potential data damage. Toshiba's Stable Platter Technology stabilizes the tied spindle motor to curb system-induced vibration and strengthen system performance during read/write operations. Should an issue occur, this drive's error recovery control helps prevent critical downtime- ensuring that your work doesn't miss a beat. With a large 128MB data buffer, the N300 drive boosts performance and shortens read speed during high data-access loads. Plus, its class-leading 240 MB/s data transfer speed will keep your projects moving at a lightning-fast pace. With excellent reliability and 24/7 performance, it's hard to beat this all-star NAS storage performer.